Ms. Malini Gadepally was born in Kolkata, India, and raised in Los Angeles, California in the US. She joined Swami's school in Prasanthi Nilayam in 9th grade, and went on to get a Bachelor's degree in English literature from the Anantapur campus of the Sri Sathya Sai University, graduating in 1991. After marriage, Malini went on to get another degree in Liberal studies and a teaching credential. She currently works as a Grade 3 teacher in the California Public School system. She is an active member of the Sri Sathya Sai Center of Central San Jose, California, and has taught SSE for 15 years now. She is also an inspiring speaker, and has spoken in Sai meetings in different parts of the US, Canada, Europe and India. 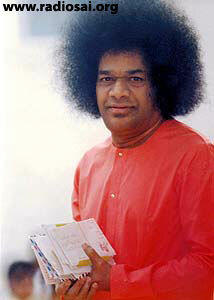 Bhagavan Sri Sathya Sai Baba is the Love, Guiding Light and Inspiration of my life. He has been the greatest influence on my family and myself, and has shown His incredible love in ways too numerous to even describe. This article is a humble attempt to portray small examples of Swami's Divine love and His ever inspiring omnipresence in my life. The privilege of being His student was bestowed upon me in 1984 when I joined the Sri Sathya Sai Higher Secondary School, Prasanthi Nilayam. Until then, I had been a Bal Vikas student in Los Angeles, California where I grew up. 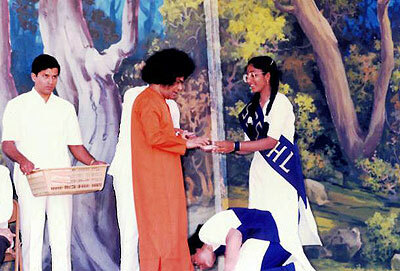 Having known Swami as a child, I was very excited to be in such close proximity to the Lord Himself. The experiences of Swami's visits and interactions are undoubtedly the highlights of my seven year stay in Swami's school and college, and are indelible in my memory. While I was studying in His Higher Secondary School, Swami walked into our classroom one day and pointing to a stack of books on the bench asked one of my classmates, "Are all these textbooks!" She said, "No Swami, textbooks and notebooks." Then Swami shook His head and replied, "Too many books, too many thoughts." We were very happy because we had 10 subjects to study, and thought that the Divine words would somehow prompt our teachers to decrease our academic load – wishful thinking of course on the part of young teenagers! Instead, a few weeks later, brand new desks were delivered so that we would have a place to store all our books! The Lord showed His thoughtfulness and compassion in even such mundane details. Another time, Swami came to visit our school soon after breakfast, and when we were all assembled in the foyer, He asked Kitchen Aunty to show Him what we had eaten for breakfast. She brought a plate with all the varieties: idlis, sambar, porridge, sprouted gram, and chutney. Swami pointed to the sprouted gram and asked her, "What is that?" She replied, "Swami, it is sprouted gram". He then took a few and put it into His mouth and made a face while chewing it! We were so happy to see that Swami Himself had taken a dislike to it because none of us really relished the gram. He, then, turned to Kitchen Aunty and asked her, "How much of this do you give them?" She said, "One teaspoon, Swami." Swami then replied, "From now on, give them two teaspoons full!" He then smiled at all of us very sweetly! From that we learnt that even if things seem unpalatable, we have to take things with a smile because in the long run, they are going to be good for us. Life's blessings don't necessarily have to be sugar coated for easy swallowing. Sometimes they may taste bitter and unappetizing, yet they are good for our spiritual health. During my 10th grade, there was a chicken pox epidemic in our school. While sneaking a peek at my brother who had it, I contracted the disease a few weeks before the 10th grade Board Exams. The discomfort and pain from having the pox all over the body (including inside the throat), was mitigated by all the remedies that Swami Himself gave for us. He asked the teachers to make pills out of neem leaves, told them to use sambrani or a special type of incense to purify the air, asked them to feed us soft foods and curd rice so that our throats would not ache so much, and would enquire daily about the welfare of the 100 of us who had got it at the time! When mumps broke out soon after, He even arranged for rooms in Prasanthi Nilayam, a short distance away from the school premises, so that the disease wouldn't spread like the chicken pox had. Our class was preparing for the 10th Board exams, and we had been praying to Swami to bless us before this momentous event. He told us that His blessings were always with us, but didn't give us padanamaskar (take His blessings by touching His feet). Disappointed, but happy that He had acknowledged us in darshan, we walked back to school after bhajans. 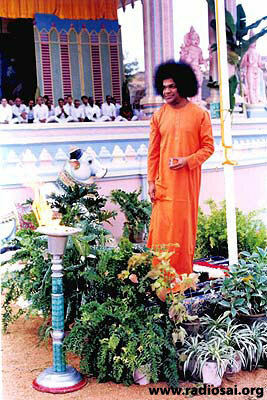 The next day, when only the teachers had gone for darshan, someone came and told us that Swami was calling us! We ran like the wind, and gasping from sheer excitement, sat in rows for the Lord to come. He came smiling with something in His hand. He looked at us and said, "Take two pens to the exam hall in case ink runs out in one of them." Our ever compassionate Divine Mother had called us to give us pen sets! He blessed each and every one of us, as well as our hall tickets. The 10th Board Exams were a nightmare as far as I was concerned. Having been brought up in the United States where there are no exams in the lower classes, the whole concept of finals was new to me. I especially dreaded Sanskrit, since the script itself was so strange, and memorisation was not a natural talent that I possessed. Swami is so aware of our innermost thoughts and feelings. He knew how much I feared the Sanskrit exam. The night before the exam, He came in my dream and showed me the whole question paper! Needless to say, my understanding of the language was so minimal, that seeing the paper didn't help me in the exam. Nevertheless, it boosted my self-confidence that somehow I would pass. I convinced myself that if the Lord Himself took the trouble to allay my fears, then I should be courageous regardless of my personal inability. With His grace, I did clear the paper. My class was the last batch to graduate from the Primary School after 10th. After we left, the 11th and 12th grades were established in Puttaparthi for girls as well. The sorrow of leaving Swami's immediate physical presence to go to Anantapur was lessened when He gave us padnamaskar before the academic year started, and said, "My blessings are always with you, no matter where you go." The five years in Anantapur were challenging and yet exhilarating. Swami came 2-3 times a year to the hostel and it was literally heaven to eat with Him, perform for Him, and hear His Divine Discourses tailored just for women, and to behold His Divine form. He told us how to sweep our rooms (including the corners), to fold our clothes neatly, and that we should study well. He said women had the greatest blessing to become mothers, and that in fact, was the primary and potent purpose of our birth as women! To me, it was such a powerful statement. His words take on a whole new dimension when we graduate and go out into the world. After my convocation was over in November of 1991, and my mother and I were leaving Puttaparthi to return home, I sat in the lines with everyone else who was leaving that day. 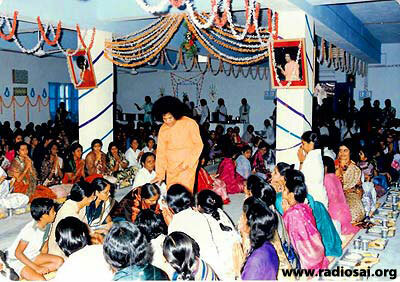 When Swami came out, I muttered, "Swami, Amma (mother) and I are going." 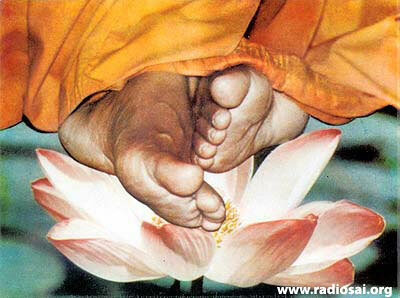 Swami looked at me and sweetly replied, "Go and come back." Then, after walking a few steps, He turned around and looking deeply into my eyes, said "Canada?" I numbly nodded, thinking to myself that I had never gone to Canada, but lived in the US and so it was the same North American continent. He kept looking deeply into my eyes and waving His hand, produced vibhuthi. He poured the ash into my hand and then sprayed the remaining bit with His fingers onto my face. Utterly amazed but happy to have received such grace, I did not think about the import of His words. Two and a half years later, I accompanied my husband on a business trip and we drove to Canada. At the end of the day, we were tired and hungry, and were heading back to the hotel. My husband was driving and he suddenly realised that the exit was to the left. As he quickly changed lanes, we were struck very hard by a vehicle behind us. I started shouting "Sai Ram, Sai Ram". Our car started to tilt, and we were about to go over the railing. The driver of the car who had hit us saw what was happening, and actually hit us again to stop us from going over. We did not realise at the time that there was a river on the other side. Both vehicles came to a screeching halt. Amazingly, no one was injured. As we were talking and exchanging information, a very well dressed watchman came up to us. He wore a suit, a cap and there was a watch hanging out from his pocket. He asked us if we were okay. We said that we were all fine and continued checking the vehicles which were badly damaged. When we looked for the watchman again, he had disappeared. In fact, there were no cars around and it was dark with no traffic passing by at all. It was only later that I realised that the watchman was none other than Swami Himself, and that the vibhuthi He had sprayed on me two years ago had saved not only me, but also my husband and the driver of the van behind us! As I look back upon a multitude of life experiences from losing two of my closest loved ones, to having burglars rob my home and taking all my jewelry, to running from a raging fire while carrying my then very young son and daughter, as well as a variety of physical, mental and emotional challenges, I know that Swami has always been taking care. He has protected, strengthened and guided me. It is in times of despair and in my darkest moments that He makes His presence felt. His words of wisdom while I was studying in Puttaparthi and Anantapur, the experiences we had as students, and the countless times His presence is felt in my everyday life, only reiterate that our beloved Bhagavan is always there. The wonderful fact is that He is there for each and every one of us regardless of our backgrounds. His love for us is the same. In the Sky and on Earth, the Sai Message is: "Love All, Serve All"
Recently, as I was driving home from work, I was missing Swami's physical form. As I looked up at the clouds in the sky, I imagined them to be His hair and smiled thinking that He is looking down on Earth at all His children. Then, I prayed to Swami with tears in my eyes and asked Him what He wanted me, His child, to do now, at this stage in my life. I am a mother, a school teacher, and a Bal Vikas teacher, and I wanted His reassurance that I was doing what He wanted. During this internal dialogue with Him, I had to stop at a Stop sign before making a left turn, when I suddenly noticed that the car in front of me had a huge sticker of Swami on the back window! I had never seen something like that before! Under His smiling picture with His Hand raised in blessing, it said "Love All, Serve All". With tears pouring down my face, my heart overflowing with gratitude, I thanked the Lord once again for His timely guidance. His Love is limitless. Without Him, life is meaningless. With Him anything is possible.